Having just finished the third book in this series I felt I should write up a review. At the time of writing, I’ve been struggling with reading. The Harry Potter books may have kickstarted my reading habbit, but before I started those, I’d read the first two in Mark’s Age of Misrule series. Picking up the third one was easy, and it felt good to be back in the world, with Church, Ruth, Laura, Veitch and Sharvi, the five main characters in this modern-world-turned-mythic adventure. The writing is clean, crisp and easy to read, although Mark has a tendancy to enjoy the word frisson, and he ensures you get to enjoy it too. The characters are believable, and easy to empathise with. The story is well paced, interesting, deep, puzzling in places, and funny in others. I was kept guessing as the final outcome all the way through, and enjoyed it all the more as a result. I certainly felt a frisson each time Church declared ‘he felt there was some deeper meaning, but it was just beyond his grasp’, because I felt the same way during much of the book, that if I just thought hard enough I’d work out where it was going, but I was never able to, and as I said, enjoyed it all the more. Our protagonists are forced together to help out in a world gone mad, thanks to the ‘return’ of all those things we thought were myth and legend. The Brothers and Sisters of Dragons (the five mentioned above), must fight for a cause, although it’s not clear which one or why, early on, and help the world survive the change that is underway. Interesting, entertaining, thoughtful, emotional, and well paced. I recommend it, especially if you like your British Mythology. After the second Harry Potter book, I wasn’t holding out much hope for the third one. I mean, authors usually just get worse, I’ve never seen one have a dip and then recover. J. K. Rowling pulls herself together and delivers a riveting read, with many of the weaknesses from the second book stamped out. Gone is the totally obvious formula, gone are the long periods of boredom. We have a gripping story about Harry and his friends, and another bunch of new and weird adults. We have touching moments and thrilling scenes. More background history is revealed, and Harry gets to learn more about his past. Well worth reading, as good as the first one, and ever-so-slightly more mature. Roll on book four. And, the best praise of all, I’m looking forward to, I’m eager for, I’m anticipating, the fifth in the series. Eat that Jordan. Well, well. The second Harry Potter book (Chamber of Secrets) isn’t anywhere near as good as the first. It feels contrived in too many places, slow to pick up and then rushed to finish at the end. The same characters are present, and they are still interesting. The story is weak however, and it feels as though the author felt the book had to have the same pattern as the previous one – of course it is set within the timetable of a school year so some things are bound to seem regimented. Some funny moments, lots of long not interesting moments, some nice dialog, plenty of annoying dialog. Overall, not impressed, but then it had a lot to live up to with the first one being rather good. Let’s hope the third one (Prisoner of Azkaban) is better. An entertaining read, capturing the imagination and providing for me, the one totally essential ingredient in any book. Empathy. I could empathise with the characters, I cared about them and what happened to them. Even a jaded old git like myself has to admit that the book was easy to read, good value for money, and entertaining. Ok, I didn’t spend hours thinking about it, nor did I cry at the end, but never-the-less, the book was well written, colourful, and full of people that mattered. A boy discovers he isn’t a waste of space after all, learns about his past, discovers his inner strength, and grows. A typical story, presented in refreshing way. Let’s hope it leads a whole bunch of kids [and not-kids] to start reading more. Without doubt, one of David’s finest books, and now my favourite, just edging Legend into the second place spot. David gives us more emotion, characterisation and heroism of all kinds stuffed into 250,000 words than any other author I know. The characters in this book leap from the page, they are fully rounded, interesting, believable and easy to empathise with. Gemmell presents battles of a different kind in this book, including a court scene which is just excellent as the more conventional battles. There is, a seige 😉 kind of. The plot clips along at his usual pace, takes slightly unexpected turns, and delivers us to the destination weeping and rejoicing at the same time. I enjoyed this Rigante far more than the previous two [Sword in the Storm and Midnight Falcon], mainly because the number of major characters is lower, the prose is less abrupt, and the story feels more personal. A fitting tribute to David’s late step-father. I’ve been reading again, which is just excellent news as far as I’m concerned. Reading is like a litmus test of my state of mind. No idea how long it will last, but I certainly enjoy reading, so we’ll see. It means less EQ time, but I’m not sure that’s so bad. The main problem will be avoiding the ‘must finish just this chapter even though it’s 3am’ syndrome. It should probably have a name that syndrome. Perhaps it does, but it should have a single word that describes it. Like ‘lating’ or ‘onreading’ or ‘freading’ or something. 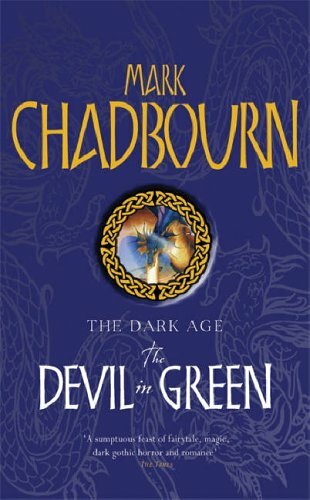 Anyway, I wanted something pretty fast paced, reasonably short and by an author I knew I enjoyed to try and pick up the reading bug again, so I picked out Devil in Green by Mark Chadbourn. It’s the first of his second series of real-world-falls-into-myth books, and I really enjoyed the first three. This is what I thought of the first series (The Age of Misrule). The second series (The Dark Age) promises to be just as entertaining. Once again, Chadbourn returns to the world after the fall, when the borders between our reality and the other realities are breached, and what was myth has now become truth. The story picks up sometime after the events of the first series, with people attempting to deal with the world as it now stands, and in particular with the Church trying to re-assert itself. With the original 5 Brothers and Sisters of dragons ‘indisposed’, Existence is forced to find another group of would-be-heroes. What follows is a claustrophobic story based on 3 different locations, with a small cast, and a tight focused story arc. There isn’t as much humour as I recall in the first series giving the first book of this series a very bleak and stark feeling to it. This is underpinned by the arrival of a Gormenghast style Gothic structure, which only adds to the bleak enclosed feeling that I’m sure is an intentional part of the story. Our heroes are flawed, and carry with them their own ghosts, some of which we uncover, and some of which Chadbourn appears to want to hold back from us until perhaps the next book. Mallory is a sarcastic know-it-all who believes in nothing and finds himself fighting to save everything, Miller an innocent believer who needs the Church, and Sophie a hippie-come-witch with a sense of humour to match anything Mallory can come up with. The supporting cast is rich and varied, and deeply British. Our heroes face a selection of other-worldly dangers, some benign, some overtly evil, and many with the same alien intellect hinted at in the previous books making it impossible to fathom their intent or their feelings for how the Fragile Creature of man should be handled. The pace is good, and the slow building tension matches the story well. I did find sections of the last two chapters fragmented, and I stumbled through them rather than following the flow of the previous chapters, but it didn’t detract enough to put me off and I’m sure a re-read would smooth out any confusion I was left with. Overall it’s a good start to the new series, with a bleak feel but just enough heroism and high points to prevent it pulling the reader down into a deep depression. Worth a read, especially if you enjoy your British mythology. Looking forward to the next one, which since the series has been out a little while, we already have upstairs!